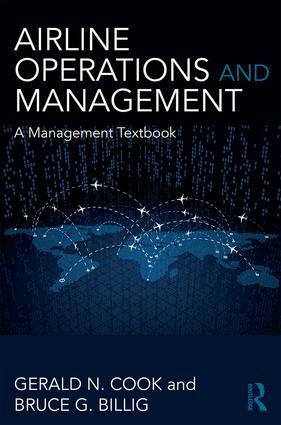 Airline Operations and Management: A Management Textbook is a survey of the airline industry, mostly from a managerial perspective. It integrates and applies the fundamentals of several management disciplines, particularly economics, operations, marketing and finance, in developing the overview of the industry. The focus is on tactical, rather than strategic, management that is specialized or unique to the airline industry. The primary audiences for this textbook are both senior and graduate students of airline management, but it should also be useful to entry and junior level airline managers and professionals seeking to expand their knowledge of the industry beyond their own functional area. Gerald N. Cook is Adjunct Professor in the College of Business at Embry-Riddle Aeronautical University. He obtained his Bachelor of Science in professional pilot technology and Master of Science in Management from Purdue University and Doctor of Business Administration from Nova Southeastern University. He enjoyed a long airline career as a pilot and in various flight operations management positions at several airlines. Dr. Cook is retired from Spirit Airlines. Bruce G. Billig is Adjunct Assistant Professor in the College of Aeronautics at Embry-Riddle Aeronautical University. He holds a Bachelor of Science in electrical engineering from the U.S. Air Force Academy and a Master of Aeronautical Science degree from Embry-Riddle. He retired from the Air Force as a Command Pilot in 1997 and is currently a captain in his 18th year at Southwest Airlines.